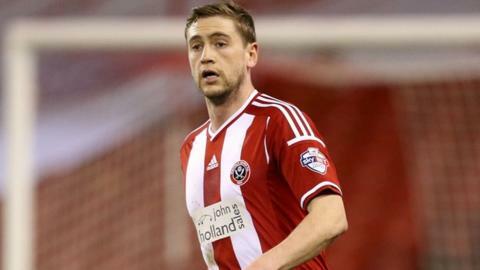 Steven Davies and Jason Holt scored as Sheffield United boosted their League One play-off hopes with a routine win over South Yorkshire rivals Barnsley. Holt went close with a header while the hosts threatened through a Josh Scowen strike and Conor Hourihane's free-kick. But the visitors deservedly led when on-loan striker Davies scored his first Blades goal with a fine looping header. Holt's 20-yard shot made it 2-0 in the second half and took United four points clear of sixth-placed Chesterfield. Barnsley remain in ninth, four points behind the Spireites, who are in the final play-off place. Match ends, Barnsley 0, Sheffield United 2. Second Half ends, Barnsley 0, Sheffield United 2. Substitution, Sheffield United. Michael Doyle replaces Ryan Flynn. Ryan Flynn (Sheffield United) wins a free kick in the attacking half. Substitution, Sheffield United. Stefan Scougall replaces Jason Holt. Sam Winnall (Barnsley) wins a free kick on the left wing. Attempt missed. Chris Basham (Sheffield United) right footed shot from the left side of the box is too high. Corner, Sheffield United. Conceded by Mason Holgate. Jason Holt (Sheffield United) wins a free kick on the right wing. Substitution, Barnsley. Kane Hemmings replaces Jabo Ibehre. Goal! Barnsley 0, Sheffield United 2. Jason Holt (Sheffield United) right footed shot from the centre of the box to the bottom right corner. Attempt blocked. Robert Harris (Sheffield United) right footed shot from the centre of the box is blocked. Substitution, Barnsley. Dale Jennings replaces Conor Hourihane. Substitution, Barnsley. George Smith replaces Cameron Stewart. Jason Holt (Sheffield United) wins a free kick in the defensive half. Cameron Stewart (Barnsley) is shown the yellow card. Foul by Cameron Stewart (Barnsley). John Brayford (Sheffield United) is shown the yellow card. Corner, Barnsley. Conceded by Kieron Freeman. Hand ball by Matt Done (Sheffield United). Substitution, Sheffield United. Matt Done replaces Steve Davies because of an injury. Corner, Barnsley. Conceded by Robert Harris. Terry Kennedy (Sheffield United) wins a free kick on the right wing. Attempt missed. Ryan Flynn (Sheffield United) right footed shot from the right side of the box is too high. Second Half begins Barnsley 0, Sheffield United 1. First Half ends, Barnsley 0, Sheffield United 1.